Minecraft X-Ray is a utility whose primary purpose is to aid in finding valuable ores and resources inside a Minecraft world. It's also very useful for simply exploring your Minecraft world, or finding your way out of a deep cave system. It is distributed under the New/Modified BSD License. X-Ray is not a mod - it is a separate program run outside of Minecraft itself. In general, X-Ray is only useable on singleplayer worlds, but if you have access to the data files from a multiplayer server, X-Ray will load those from your harddrive without problems as well. The original X-Ray versions were written by plusminus, but has been maintained here since v2.7. Many thanks to him for providing both the application and the sourcecode, so that it could live on. Minecraft X-Ray is unrelated to the clientside mod also named XRay (now part of the CJB mod set), or to the X-Ray Texture Packs. As mentioned above, Minecraft X-Ray is a utility whose primary purpose is to aid in finding valuable ores and resources inside a Minecraft world. By default, when you select a resource type to highlight, X-Ray will cause any blocks of that type to visibly glow within the range of loaded chunks. The glowing can be toggled between two different styles, or turned off entirely. Turning the glowing off will still leave all instances of the selected mineral visible on the screen, which can be quite useful for more plentiful minerals like iron. X-Ray can also be configured in the GUI to highlight any block from Minecraft, not just ores. Additionally, X-Ray is somewhat useful for taking a look at natural underground caves, to find out how extensive they are, or even to help find your way out if you're lost. 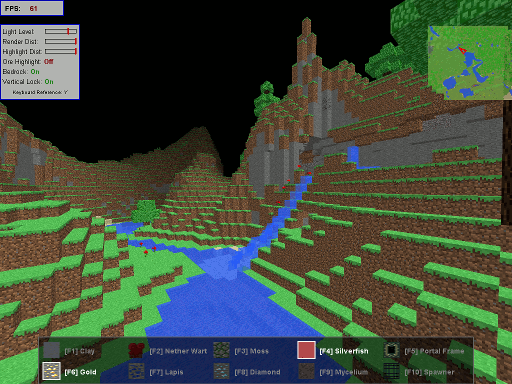 Minecraft X-Ray operates by loading your world from the hard drive. This means that for most people, X-Ray will not be useful for finding ores on multiplayer worlds, which are typically stored on a server the user won't have access to. If you do have the server data files, though, X-Ray will load it just fine, and even let you cycle through camera presets of every player on the server. Support for the new Chunk format "Anvil," which was introduced in Minecrat weekly build 12w07a and was included in Minecraft 1.2. X-Ray should still be able to open worlds as far back as Alpha. Full support for all blocks through Minecraft 1.2. This includes Nether blocks, Lapis Lazuli, Note Blocks, Beds, Trapdoors, Pistons, Huge Mushrooms, Iron Bars, Enchantment Tables, Jungle blocks, Redstone Lamps, etc. Blocks are loaded on-demand, and the app should handle worlds of any size. Keybindings and resource highlight settings can be modified inside the program itself. "Explored" highlighting, which shows you where you've placed torches in underground tunnels. See the README for more information, and the TODO file for a list of known bugs and features that I'd like to implement eventually. If you've got bugs to report, the best place would probably be Sourceforge's bug tracker. Many thanks to plusminus for creating the utility, and double THAT amount of thanks for releasing the sourcecode as well. Minecraft X-Ray is released under the New/Modified BSD License.